I'm using shadow wraps because that's my favorite short row method. But everything explained here will still work with wrap and turn or any other type of short row method. 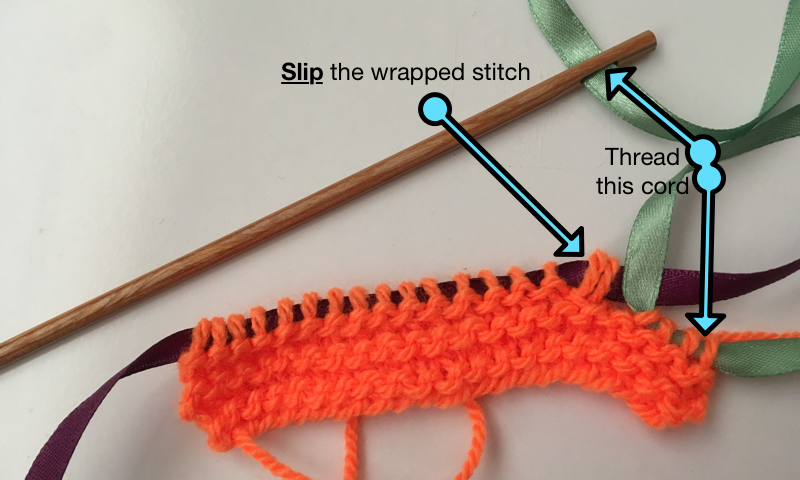 I'm not explaining how to make the double stitches, there are plenty of knitting tutorials and videos about shadow wraps, for example here. And like all knitting stitches they work the same when knooking. 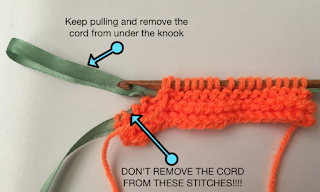 What is different in knooking is how to manipulate the cord while making short rows. Of course you can take a new cord for every row, but who wants to juggle that many cords? So instead I show you a method for which you need two cords if you work on a flat piece and if you work on something that is in the round before you start the short rows you don't even need an extra cord (but you can, and it might help). It is useful to work with two cords with a contrasting color. Lets start with a row of 20 stitches and we are working simply in garter stitch. We are told by the pattern to wrap and turn after stitch 15. Before knitting this row remove the cord from the knook and attach another piece of cord. It will help if it is a different color. 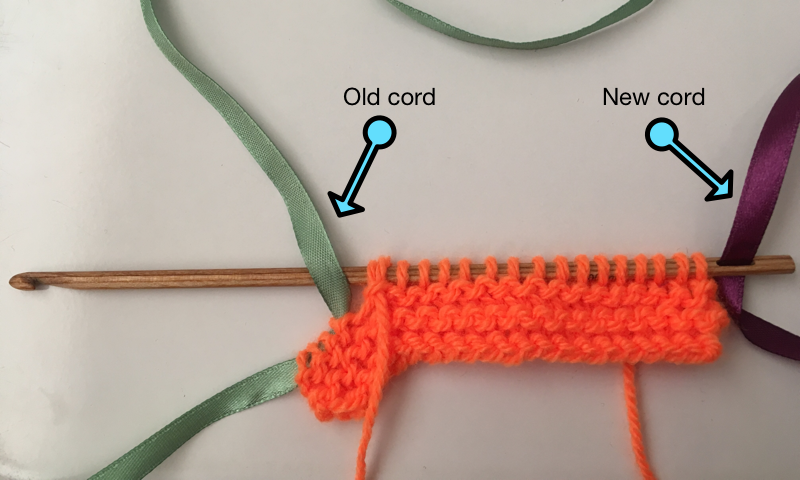 With the new cord on the knook, knit 15 stitches and in the next stitch create a shadow wrap (or if using conventional w&t, wrap this stitch). 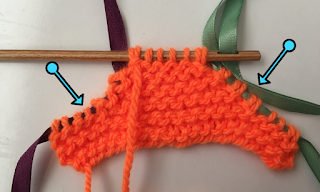 It is important that you slip the wrapped stitch on the knook (we are going to slip it back in the next row). You can see in the picture below that the last stitch on the knook is a wrapped stitch (a shadow wrapped stitch in this case). Start pulling on the old cord directly on the left of the wrapped stitch. 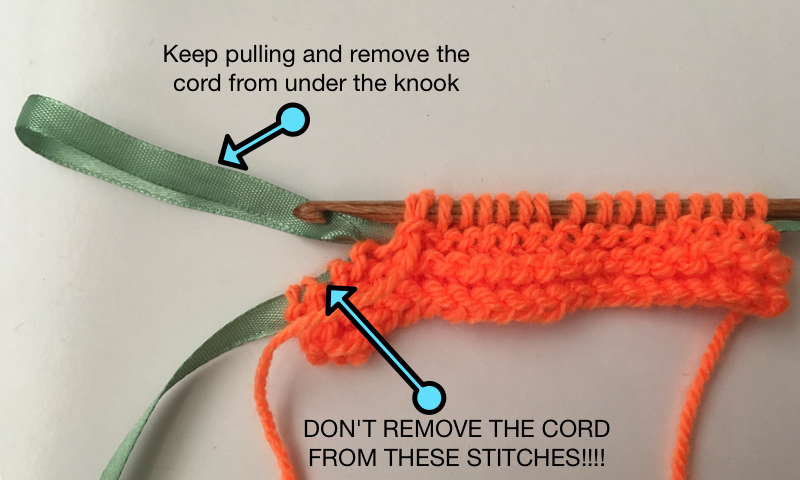 After you created a loop you can carefully pull the cord out from under the knook. The stitches on the left of the wrapped stitch will remain on the old cord. 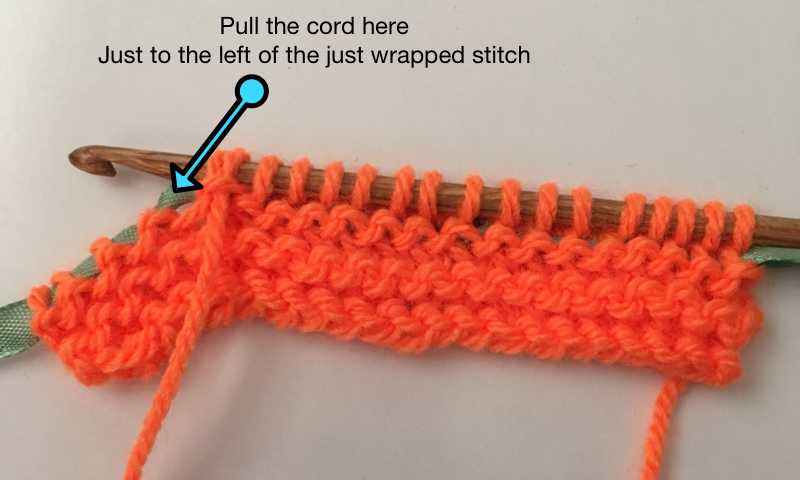 You can now pull the new cord through the stitches you just made and turn the work. Now remove the cord you just used from the hole in the knook (in my case the purple ribbon) and insert the old cord again (in my case the green ribbon). You can now start knitting the next row. Very important: slip the wrapped stitch, don't knit it, slip it. Lets imagine that the pattern instructions for row 2 say to knit 10 stitches and then do another shadow wrap and turn. The stitch we slipped doesn't count towards that 10. So knit 10 and then make another shadow wrapped stitch. Again pull out the cord directly to the left of the wrapped stitch. Pull it out and pull through the knook and the cord. Turn your work and it should look like this. You just keep changing cords after every row and remember to slip the wrapped stitches. Then you are all set and can knit a lot of short rows with only 2 cords. Here is my project after a lot of short rows. You can see that each cord carries the wrapped stitches on one side of the work. 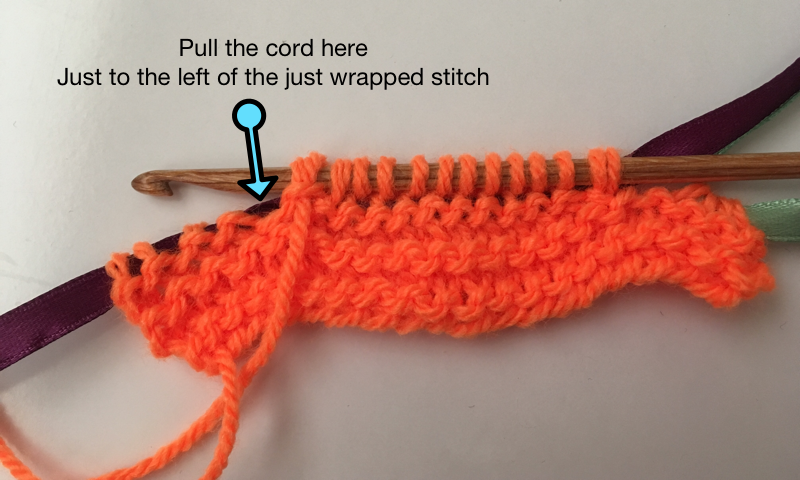 If you were working in the round before starting the short rows you don't even need an extra cord (you can though, if you want). You can alternate the two ends of the cord instead of alternating between two different cords. The Andean bracelet technique is a wonderful way to create a 2 ply yarn using up all of your hand spun singles. The drawback of the technique is that you use a hand to wind your yarn on and you can't easily stop in the middle of winding. After you created your bracelet you can leave it on your wrist (again not very practical if you need to stop) or transfer it to an object, like an empty toilet paper roll, but you have to be careful it doesn't slip off and you are left with a tangled mess (especially if you put a lot of twist in your singles). There are several plying tools on the market, but none of them were exactly what I was looking for. So I decided to create my own. 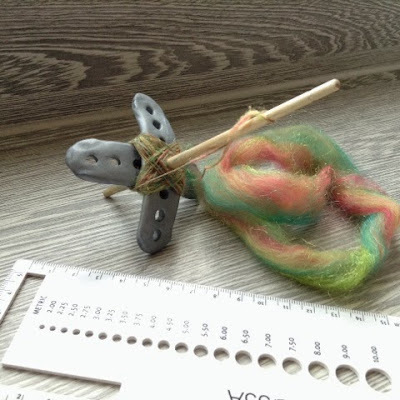 This plying tool is lightweight, portable, and your finished bracelet won't slip off. 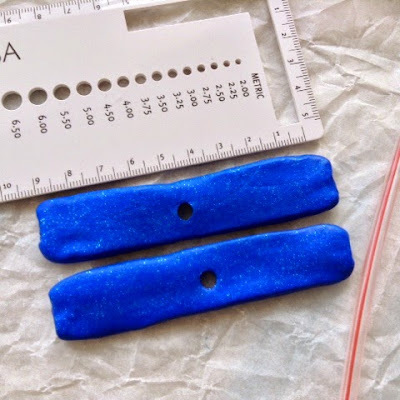 The process is very simple and the materials cheap and easy to obtain. 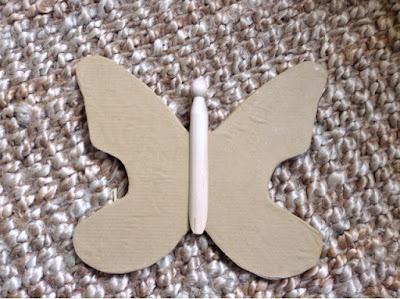 Here are the instructions on how to create and use your own DIY Flutterply! 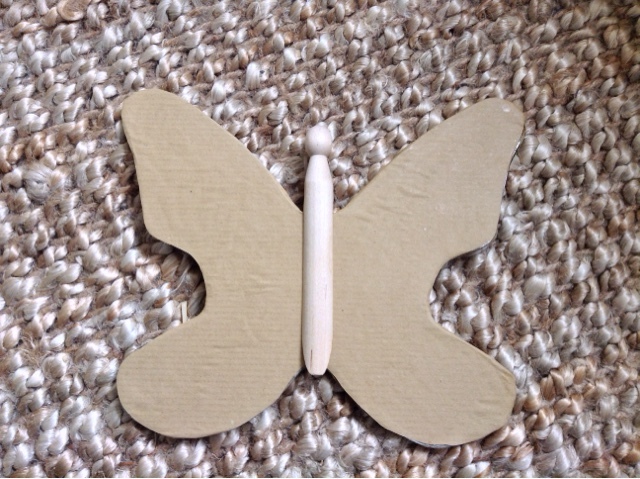 One wooden clothespin. You'll need one of those old fashioned peg type designs (see picture) and not one with a spring. You can often find them in craft stores and of course you can buy them online. In the Netherlands you can find them at Dille & Kamille, for example. Some cardboard large enough to fit the "butterfly" design. The thickness much be such that you can easily slide the clothespin on and off. Don't worry about it being too loose, the yarn will hold it in place later. It would be more of an issue if it fits too tight and will be difficult to remove. I used two thinner cardboard parts and glued them together. 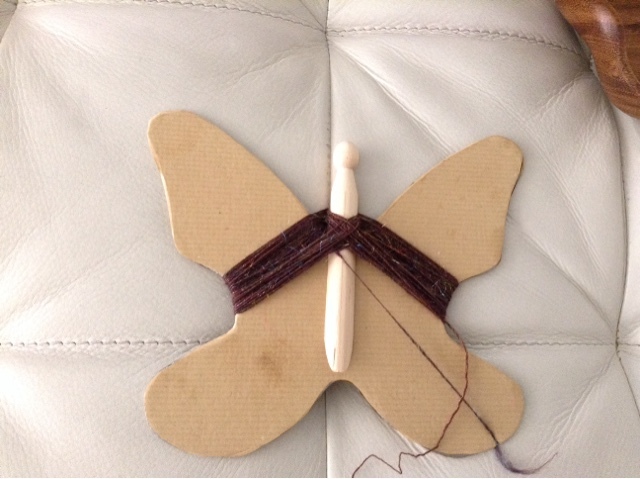 The butterfly pattern. Download the PDF here. 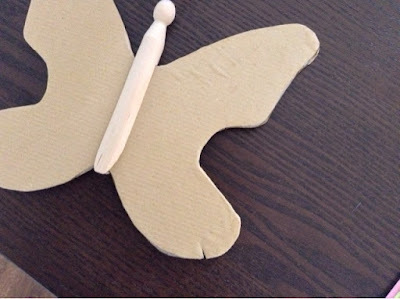 Step 1: cut out the butterfly. 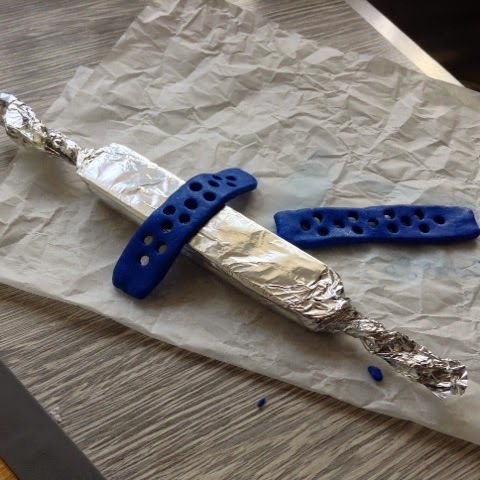 If you cut out multiple layers glue them together. Step 3: Cut a small slit at the bottom of on of the wings to hold the start of your single. Of course you can now embellish as you wish. 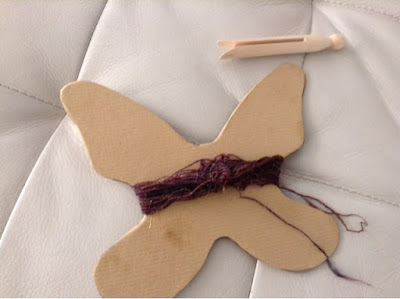 Colors, buttons, glitter.... just remember that there will be yarn wound around part of you butterfly (see the instructions below) so you want to keep those parts free of things the singles could catch on. Also take care you don't use things that can transfer color onto your carefully spun singles. If you want to make a sturdier more fancy version you can also cut out the wings from some thin MDF or plywood. I want to try this myself if I can find a suitably thin piece of wood and when I do I'll show the result here of course. Start by securing the start of your single in the slit. Now follow the scheme below to wind on your single (or look here for an excellent drawn step-by-step tutorial, or search YouTube if you prefer videos). Now simply remove the peg and you are left with a bracelet nicely secured on the butterfly wings. 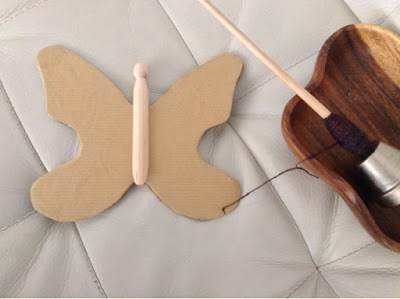 Grab both ends and start plying! I have just released my first paid pattern, Guna, on Ravelry. I'm very excited about it and it is a design of many "firsts": first knitting design, first shawl, first pattern that I had tested, first pattern that I'm trying to sell. Here I'll try to explain a little about the designing process of that shawl. 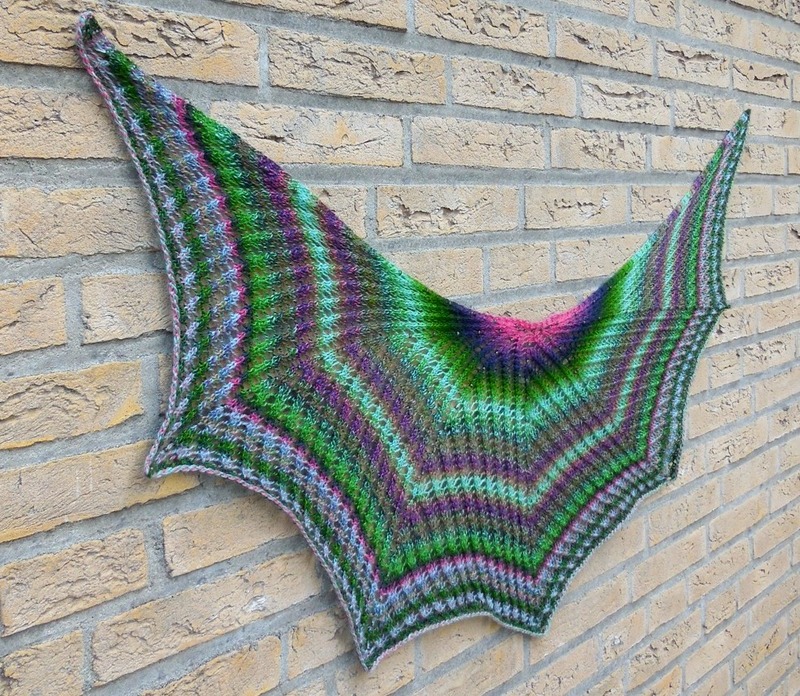 I really like the idea of shawls you can just knit and knit until you run out of yarn (1). Especially now that I am spindle spinning my own yarn, I really want to use it all up. 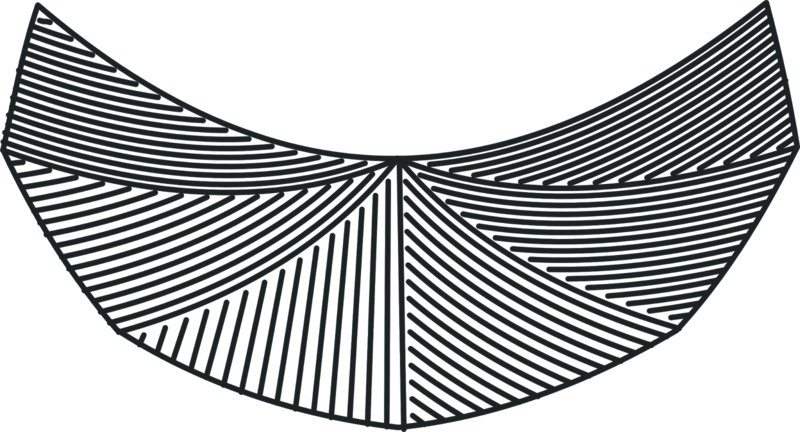 I also learned that the shawl shape I like to wear is a crescent (2). And I like an open lacy fabric (3). So I wanted to design a shawl incorporating all these three elements. A lovely bat wing shaped shawl. I'm currently making another one in hand spun yarn. You can find the Guna pattern here. Will there be more shawl patterns in the future? I have some things in mind, so watch this space. I thought other people might also want to try making a spindle, so I made another one and took pictures of the process. 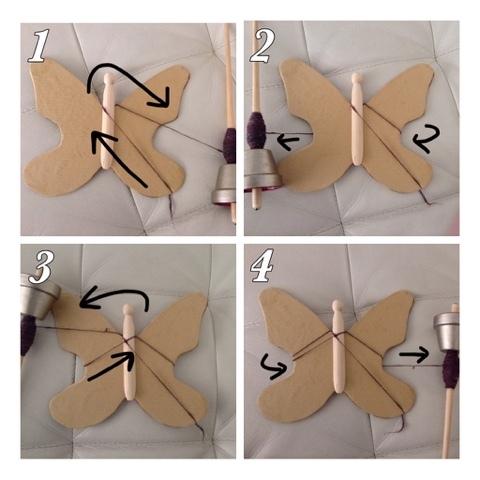 It is really simple to do, and you only need two things for the spindle. 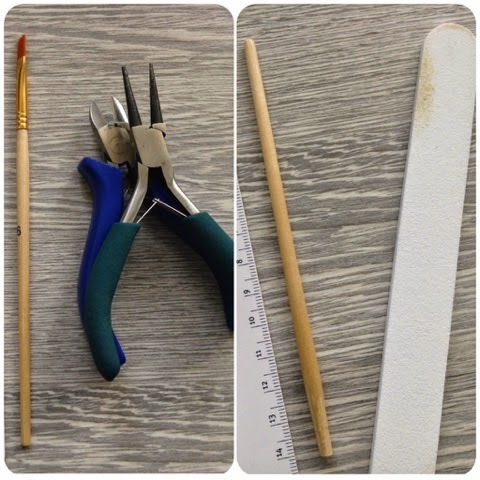 A piece of polymer clay for the arms and a paint brush for the shaft. What type of brush and how much clay will depend on how large a spindle you are planning to make. Also remember that the (upside down) brush handle will be your shaft so you need to like its shape and diameter. I prefer to spin thin yarn so like my spindles light. I started with a small cheap brush and half a pack of Fimo (28 grams). Not all of this clay will end up in the arms, so my final spindle will be lighter than 28 grams. Making the shaft is easy. Remove the brush from the handle. You only want the wood to remain. How easy or difficult this really is will depend on your brush. The arms are a bit more work. First divide the amount of clay you want to use in half. Then make two rolls out of this. 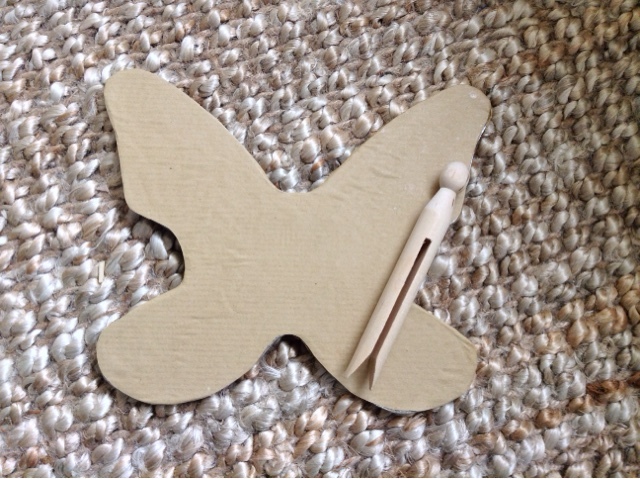 Flatten the rolls to create the base shape of the arms. And cut them to size and make them nice and even. At this point you might want to check with a kitchen scale that your arms are the same weight. If not, modify until they are roughly the same weight and size. For this tutorial I did not make them very even, but you can perfect their shape as much as you like. Now make the hole for the shaft. One in the center of each arm. 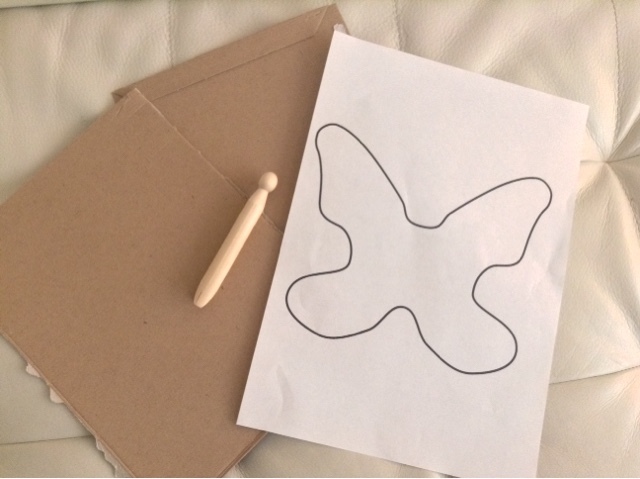 I started with making a hole using a drinking straw and then made it a bit larger. Carefully check the size on the shaft. Make sure the hole is not too large, if it is too small after baking you can easily make it larger using the tip of a sharp knife (or craft knife). If you want to decorate your arms with engravings do it now. Or if you like your spindle light like me, cut out some more holes in the arms. Do a final weighing to make sure they are still similar in weight. You can try to make them as even and pretty as you like. My quite uneven versions still work well enough, so don't worry too much about perfection. 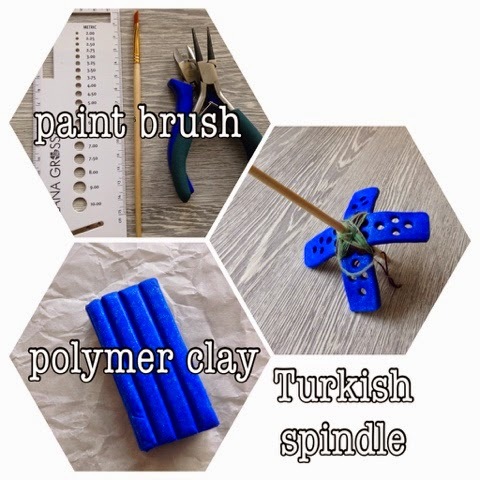 You can simply bake the arms flat, but most Turkish spindles seem to have curved arms. You do want the central part of each arm, where the two arms will touch each other, to be flat. If you can find a small flat bottom (oven safe) bowl, you can drape your arms over that. If not, like me, you can make a support yourself. Determine the width the flat part needs to be and cut out a few rectangles of this width from cardboard. Stack these rectangles and cover them in aluminum foil. Now you can drape the arms over the block you created before they go into the oven. If you want you can make a more elaborate support with curved sides. Now bake according to the instructions of your clay. I baked 25 minutes at 110°C. After baking allow the arms to cool. When cool check the fit on the shaft. If the hole it to small or uneven, use a knife to enlarge it carefully and check often, you don't want it too large. Slide the arms on the shaft and you are done. Now you can take it for a spin. Or you can decorate the arms and shaft. 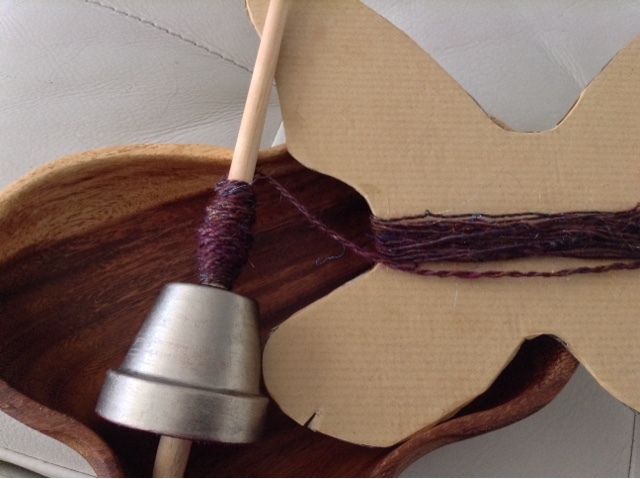 Decoration possibilities during and after the creation of this spindle are endless. 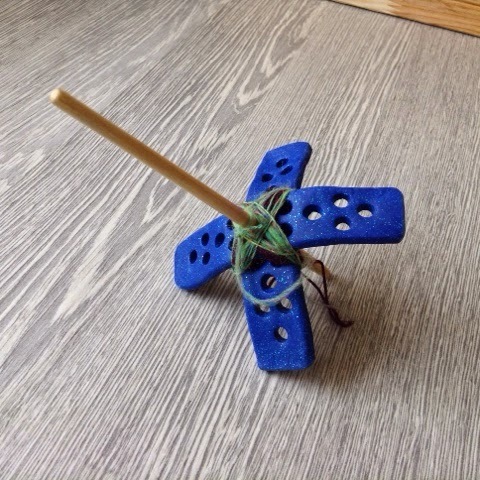 There you have it, a quickly made Turkish spindle using cheap materials. Happy spinning! I started drop spindle spinning about a month ago and I love it. Then I discovered chain plying on the fly and now I can't stop spinning. I like alternating spinning and plying and in the end I have an plied yarn, no more steps to take (apart maybe from joining smaller balls to create one larger skein). 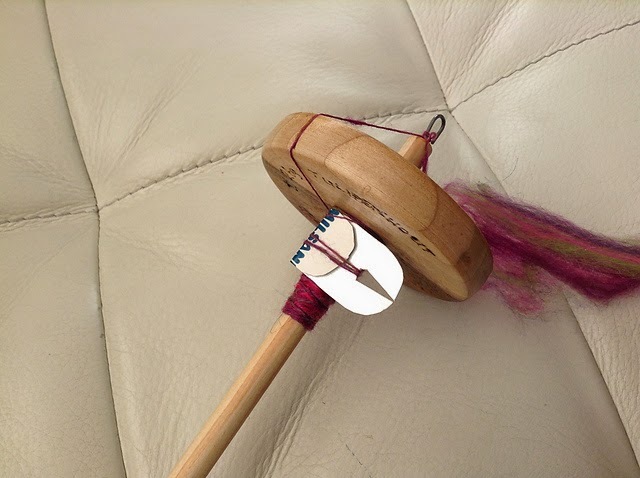 There are a lot of videos on the internet showing ply on the fly with a spindle. The drawback of chain plying on the fly is how to keep the yarn loop of the last made chain open. For this I came up with the "nifty n-ply tool" (chain plying is also known as n-plying, where the n stands for Navajo, I think "nifty n-ply tool" has a nice ring to it). To make the tool all you need is a juice box or milk carton. You could use some other sturdy paper too, but I like the juice box carton because of the smooth surface. It keeps the yarn from catching on it. 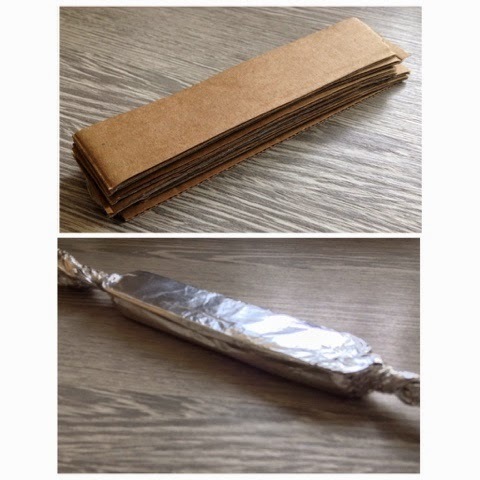 Also it is sturdy and cheap, it is easy to make a new tool. The gray part should be cut out, I make it tapered so the yarn does not slip out easily. 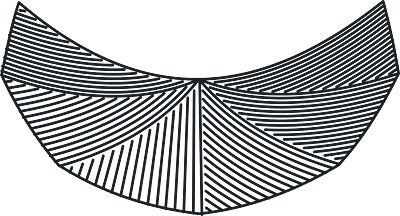 Fold over the dotted line. After every length of singles I keep winding one time around the tool so it helps me count how many lengths I have done, but that is just a personal trick and not necessary. Once your loop is as long as you want it to be, unhook the tool from the old chain loop and insert it again at the top of the new loop as before. Continue chain plying in this way. 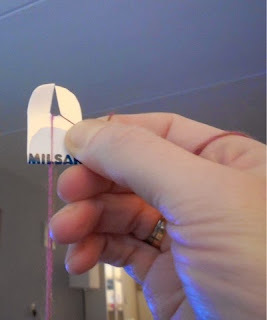 In most craft store you can find cheap plastic bobbins for embroidery floss. 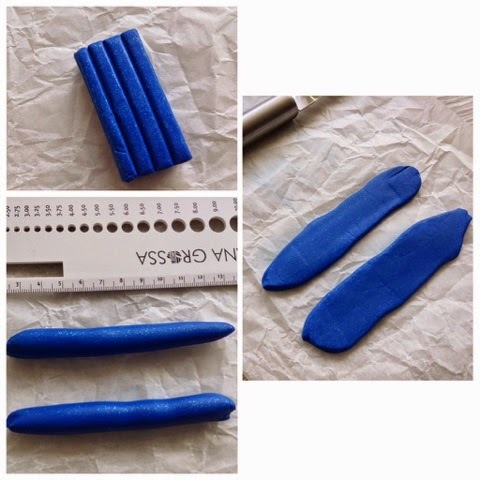 I made a tool out of these as well, which is sturdier than the tool above. 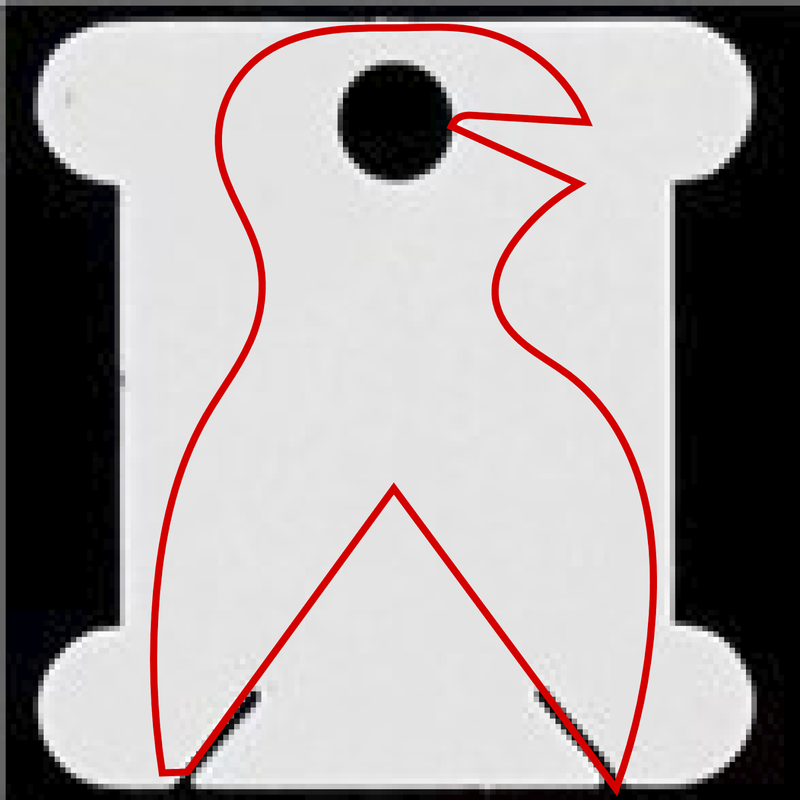 Just cut the tool out according to the template below. 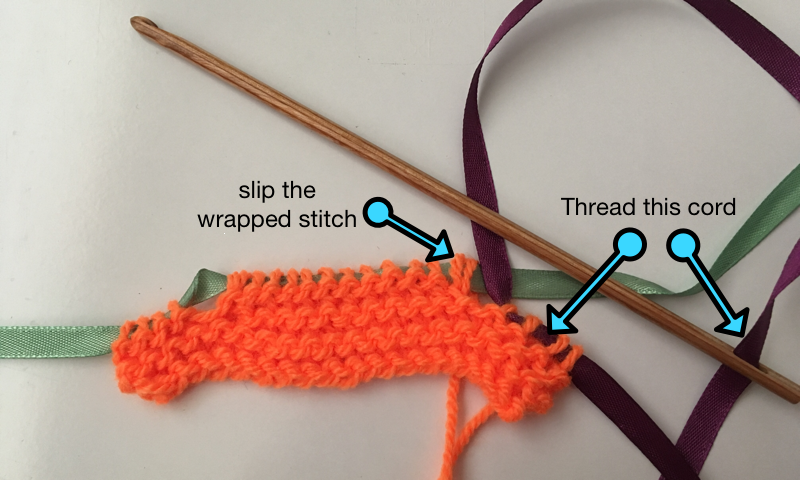 You won't have the "fold over" part, but instead you can use the hole to assist you with threading the single through the loop. I actually prefer this plastic tool to the tool above. Rainbow star made with 7 colors of cotton and a size 2.5 mm hook. I used scraps I had laying around which were not all exactly the same weight. Five differently sized stars. They are made with thin (pearl) cotton, kidsilk haze (outer edge) and a size 1.5 mm hook. This pattern is similar to the growing heart pattern, in that it keeps its shape when you make the star bigger. Dit is een patroon van een ster dat zijn vorm behoudt, ook als je hem groter maakt.